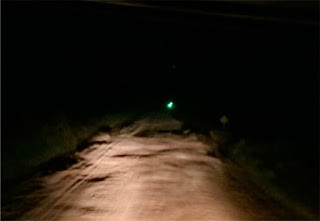 An audio recording circulated this past Monday - October 29, 2018 - on WhatsApp that purportedly reported the apparition, at 2:30 a.m., of a green light in the middle of a field. A loud detonation was heard afterward and the light climbed into the dark sky until it vanished. According to the account, it all occurred on a road near Routes 19 and 16 between Villa del Carmen and Cerro Chato, some 45 kilometers from Sarandí del Yí, the area in which the well-known Sainz business is located, handling over 100 trucks per day, hailing from various communities. The person who first tells the story of the light - which he subsequently refers to as a UFO - states that this case was not unique. In the same area of rural Durazno, another worker had made similar remarks. The second truck driver says that the blue light was swinging alongside his vehicle, and after following him for a considerable stretch of road, turned and vanished into the sky. We are sharing two audios (in a single recording) received at the newsroom. You may hear other details from those who claim to have witnessed an uncanny experience, which was accepted calmly and with a good sense of humor. First Voice: "Around 2:30 in the morning I heard dogs barking, and I went out to take a look. I saw a green light and thought, damn, could it be a hunter? One who went out with a green lamp to spotlight critter (coughs). And so I looked at it and suddenly I saw it flying around the field, really fast, and then it went up to the sky, really high up. Then it disappeared. It spun and I never saw it again. So I thought, could it be a UFO? And that's what I believed. Half an hour later a trucker came by to fill up on gasoil, and he said to me: "Do you know that one of my fellow drivers on the road came across a green light that moved in every direction?" So I said, Ah, that's the same one I saw! I've seen the very same thing, I told him. [The trucker said] this happened in the middle of the countryside and it swung beside the truck, then moved up and up, there was a flash and it vanished. And that's where we left it, it was a UFO and so forth. Strange things that happen. A while later another trucker came by, the one in the audio, and he sent me an audio, saying a light appeared beside him and paced him, slowly, flanking him. It moved in every which direction. It was as if it was keeping him company before it flew up and disappeared. So I thought one must be nuts to see something like that (laughs)." Second Voice: "Have you sped up, sped up, sped up? Things were tough here last night in Los Sainz. I was on my way to Los Sainz when the lights on my truck cut out. They turned off twice and the truck was left without power. Someone else at Los Sainz had had a blue light appear before him. Took a photo of it in front of him [garbled] there was a flash, a blue flash. So I left Los Sainz, a few hundred meters out, looked to the side, driving easy and slow, and I saw a blue flash. Blue, very blue. It moved to and fro and then vanished. So I told myself, it's your tough luck, buddy. But then it went away, I don't know." Costa Rica: "We Have Seen Two Types of UFOs"